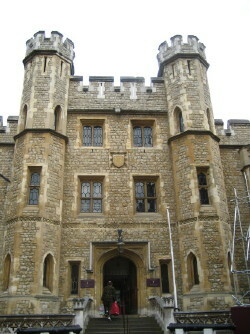 Last weekend, one of the first things Evan and I did with my parents was go to the Tower of London. 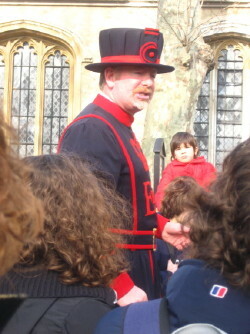 Evan had been on a previous trip to London and loved the tour, so we dutifully got into a group with a ton of other tourists and had a fantastically flamboyant Beefeater (aka yeoman warder, or maybe gentleman warder, since they seemed to use the term interchangeably) show us around. He told us about beheadings, kings, queens, wars and prisoners, all with a bit of a smirk and and a wink. It was jokey and very scripted, but he put in an emphatic performance. The only time I had any complaints was when there were helicopters overhead and I couldn’t hear him for a few minutes. The tour also left us with more questions than it answered, and the guide didn’t go off script to take questions. I feel like I should do some reading. 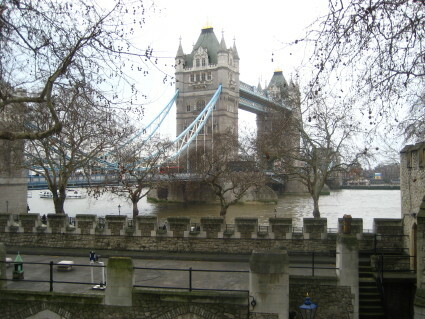 After the tour was over, we had some time to explore the parts of the tower that weren’t on the Beefeater path. We checked out the crown jewels — very impressive and sparkly, of course. Then we saw the White Tower, the oldest of the complex’s buildings, which house an armory exhibit with lots of gun, armor and statues of horses. We also saw a mini changing of the guards in front of the crown jewels, which disrupted a “historical reenactment,” which, like the tour, was more drama than history, but looked like fun. 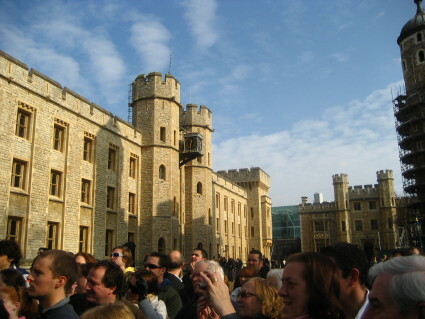 We also saw the ravens, the tower bridge, prisoners’ cells and jewel-less crowns. Interesting fact of the day: The royal family can’t afford to buy all its own jewels, especially diamonds, so they often rent. Congestion Charge a Health Benefit? My parents are leaving tomorrow, so I’m off for one last afternoon of sightseeing and one more dinner. 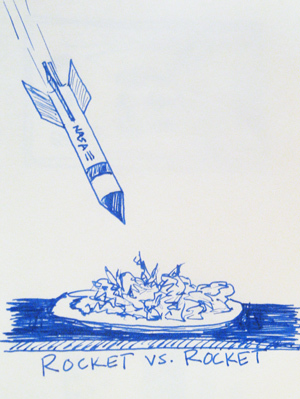 Then blogging should be back to normal, with lots of pictures, drawings and my usual inane commentary. Who would’ve thought that after leaving the land of earthquakes, I’d be in one, albeit rather far from the epicenter and not that huge, in London. Last night, while lying in bed at about 1 a.m., everything started shaking. I asked Evan if he was shaking his leg or something. He was asleep and got very confused when I asked him. It felt like an earthquake, but I wasn’t totally sure, since it wasn’t that bad, and sometimes the apartment shakes, like when we or any of our neighbors is doing laundry. Evan doesn’t remember feeling the quake at all. Anyway, I found out this morning that it was indeed an earthquake — a magnitude 5.3 in Lincolnshire, which seems to be quite north of London. Apparently there was a small amount of damage, and currently there’s only one person reported as injured. P.S. sorry I haven’t written much in the past few days — my parents are in town and I’ve been busy playing tourist. Expect lots of posts ad lots of pictures soon. Lots of stories posting this week! One that I would recommend reading is “Slashing Student Costs” about BookRenter.com, an exciting new company with a 26-year-old CEO that rents college textbooks (though you don’t have to be in college to rent and the company does stock some normal books). I originally found Colin, the CEO, when I was doing some research for the article I did on former Google employees who started businesses, though I didn’t write about him then. I was happy to reconnect, though, and we had a long conversation about college, textbooks, entrepreneurship and more. This is one of those companies that has an incredibly simple base idea, makes a lot of sense — the first thing I said when I learned about it was, “I wish this was around when I was in college” — and should go far.